The decision of whether or not to wear a spur while riding your horse changes on a daily basis. 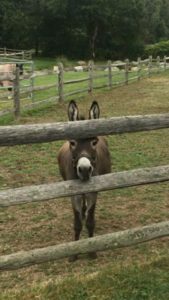 At Back Bay Farm we believe spurs should be used in addition to, not instead of, your natural aids: leg, seat, voice, and hands. Using your spur should not be obvious or rough, and to help achieve all of these things, we have a few suggestions. What spur should I wear? We suggest having a few pairs of spurs in your trunk. The first should be a small spur called a Tom Thumb. 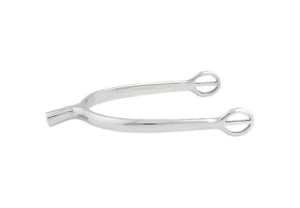 The end of the Tom Thumb shank is usually a bit more rounded, although some are flat. These are usually ¼ inch long and come in both child and adult sizes. 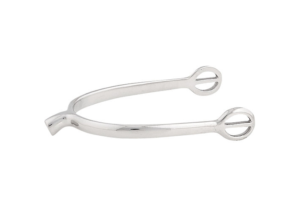 We suggest a nice black leather strap for these spurs as they are often used for showing. The second spur you should own is a Prince of Wales spur. These come in a few lengths, usually ¾ inch or 1 inch. Either is fine. The ends of the POW spurs are flat and definitely have more of an effect than the Tom Thumb due to their length and edge. Again, pair these with a nice black leather strap. How do I wear a spur? Spurs should always, always point downward when they are on correctly. The buckle should be on the top of your foot, facing the inside of your boot so that the excess strap is secured on the outside of your foot. Some people like to position spurs below the spur rest on your boot, some people like to wear a spur above. This depends on your horse and the situation. We recommend always having Robin or Megan look at your spur before you ride. Why do I need a spur? Just as there are days when your horse is wild, there are also days when your horse may be more tired. It could be the final day of a week-long show, or a hot day when no one wants to be working at all! It could be that your horse is a bit lazy in general. Whatever the reason, there are days that your leg needs a bit of an extra edge, and those are the days to wear a spur. Your spur is never a first resort—it is a reminder to your horse that they need to listen to your leg. That is why a rider without a strong leg shouldn’t wear a spur: a spur on a leg that is swinging or bouncing around will irritate your horse, and can injure a horse’s skin. However, when used correctly, a spur is a great reminder to your horse that you mean business and impulsion is the name of the game! ← What’s in your tack trunk?